Normally if you think of March, you think of spring, right? But… somehow days are much colder now than they should be and that is why many Dutch people have already fallen victim to schaatskoorts, which you could translate with skating fever. Just in case that you would like to skate, here are some handy words and sentences that could come in handy once you are skating on real Dutch ice! There are two physical activities that are typical for Holland and Dutch people. The first one is fietsen (to bike) of course and the second one is schaatsen (skating). 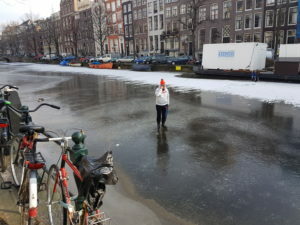 Unfortunately for Dutch people schaatsen is not something that you can do everyday, because you need ice first. 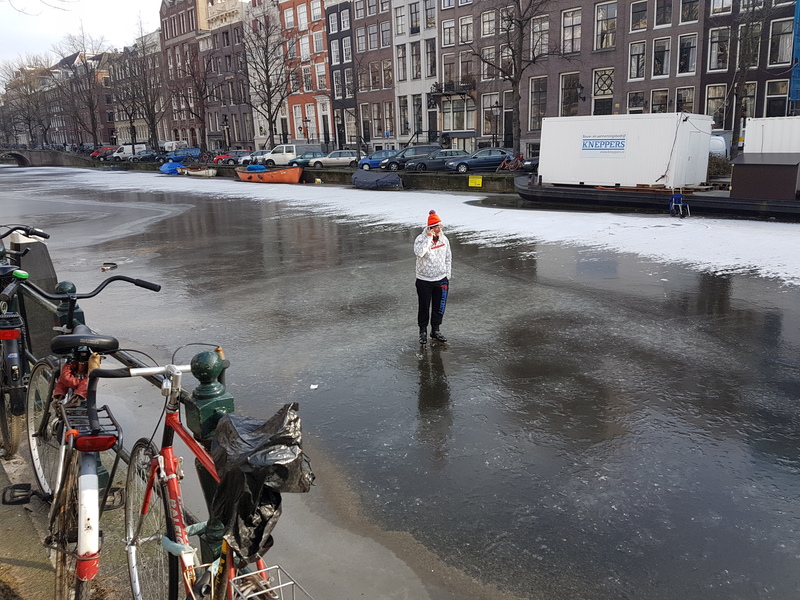 That is why Dutch people start to feel anxious and nervous when the temperature goes down below zero… Now all that a Dutch person can think of obsessively is this: kan ik schaatsen (can I skate?). That is why you can find some useful words and sentences that come in handy once you start to skate or real Dutch ice! 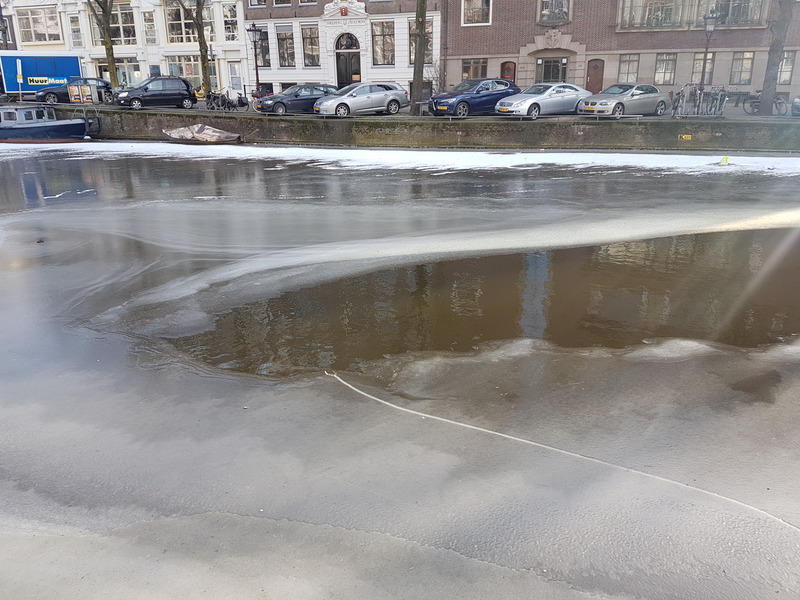 As you can see glad is a word that could be misleading… if you say: het ijs is glad, then it does not mean that the ice is happy 🙂 Glad means that something is slippery… Also een straat (street) can be glad, so then you also have to be careful. It is very easy to slide and fall on the ground… If you say ik ben op glad ijs, then it can also have a more metaphorical meaning… you are in a risky situation where many bad things can happen. Het wak is a very important word to understand. It is a hole in the ice. Birds love it, because they can swim there, but it is no fun at all to fall in een wak. So make sure that you understand it if Dutch people try to warn you! One thing is certain. Een wak will certainly wake you up, because it is extremely cold brrrr…. Here is another funny thing…. Noren are people from Norway, but in Holland you can also skate on them 🙂 If Dutch people talk about noren (without a capital letter) then they are talking about skates.. This is the first skater that I discover on a canal in Amsterdam. It does not happen every year, so this makes it very special. There is one thing that is typical for 2018…. this man skates with a mobile phone! Have you skated already? Which words or expressions do you know that have something to do with ice or skating?